Amaryllis is a plump flower bulb that is full of surprises! Plant and water it – and enjoy weeks, even months, of lovely blooms in the dark days of winter. Few Flowers are more flamboyant! 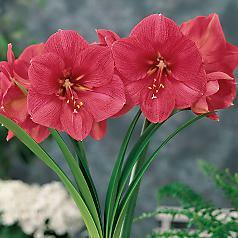 When amaryllis flowers are in bloom, winter feels brighter! Once planted, leaves and stems begin to grow within a few weeks and blooms appear approximately eight weeks later (sometimes a little more or less). A single amaryllis bulb produces multiple stems, each with multiple flowers. Plant in soil (in a pot with a drainage hole). Plants should bloom about 6-8 weeks after planting. Determine the date you want your amaryllis to bloom and plant it according to that time frame. A snug fit works best, choose a pot sized only slightly larger around that the bulb itself. Add a base of potting soil deep enough so that when the bulb is in place its neck and “upper shoulders” are just above the rim of the pot. Fill in around the bulb with soil. Water well, letting the pot drain. Water sparingly until green growth appears, then water regularly keeping soil moist but not soggy. Move the pot to a sunny spot. Plant in water (in a clear glass cylinder vase). Amaryllis can be grown without soil, too, because all the food the plant needs is already stored inside the bulb. Place a three-inch base of pebbles, stones or shells in the vase; place the bulb on top; then add some more pebbles around the bulb to provide stability. Add water to initiate growth. The water should be shallow, reaching just below, but not touching, the bulb. Keep water topped-off to this level (this is why you need a clear vase). Once growth begins, move the vase to a sunny spot. Stay Cool – Once the flower begins to open, move the plant out of direct sunlight or high heat areas, so its blooms will last longer. Place in a cool spot when not at home for longer bloom time. Sources of heat to avoid: radiators, refrigerators, direct sunlight. No Tip Top – Sometimes amaryllis plants become top-heavy and tippy. Here are some techniques to keep your potted plant upright: top dress by adding a little more soil (and weight); stake the plant by making a corral of sticks or branches, then securing the stems to these supports with a lasso of ribbon, string or colorful raffia; double pot by placing the potted plant into a 2nd heavier pot to provide additional stability. Drip Dry – The best place to water small houseplants is in the kitchen sink. Run cool water slowly, let it build up slightly in the pot, and then allow it to drain out the pot’s bottom drainage hole. Never let the pot sit in a water-filled saucer. The More the Merrier – If one bulb makes an excellent display, then grouping several bulbs together is spectacular. Try planting three, even five amaryllis bulbs shoulder-to-shoulder in a broad decorative container. The pot needn’t be deep. As each bulb can produce several stems in succession, with each stem topped by four to six colorful flowers, this multi-bulb approach creates a pot dense with multiple stems in various stages of growth. More stems result in more flowers, more excitement and a bloom season extending over several months. The effect works best when all of the bulbs planted together are of the same variety. 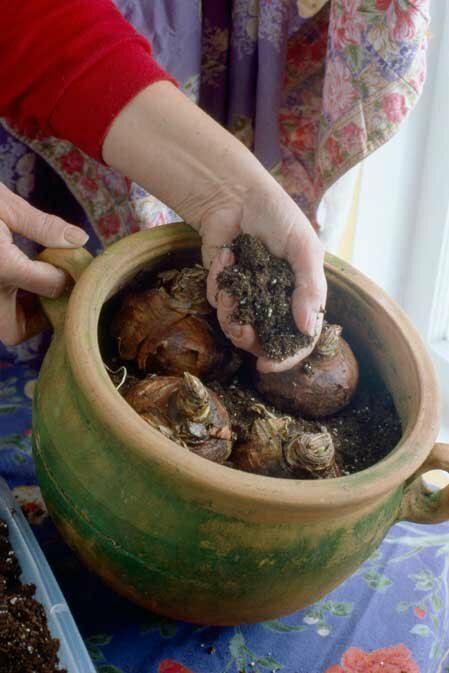 There is also a practical advantage to planting multiple bulbs: broad-based pots are nice and stable! After Bloom – Each stem will produce four or more flowers. As each bloom fades, snip it off. When all blooms on a stem have faded, cut off the entire stem about an inch from its base. The Show Goes On – Don’t assume the show is over after the first flower stem fades. Your bulb will probably produce a second stem with four more flowers. Sometimes a third stem pops up. Whoopsy Daisy – Sometimes flower-topped amaryllis stems topple. No worries – just cut and display that stem and its flowers in a vase! Bring ‘em Back – Unlike many forced bulbs, amaryllis can be brought back to bloom again for years and years, even decades! Here’s what to do: grow “keeper” amaryllises in soil, not water. Once growing, water as needed, and apply a houseplant fertilizer monthly until August. Then, leaving the bulb right in its pot, give it a rest for two months (no water, no light). After eight weeks or so, add a fresh topping of potting soil. To initiate the next bloom season, water thoroughly letting the water drain out the pot bottom. Place the pot in a warm area and water sparingly until growth begins, then move to a sunny spot and water as needed. Now the whole glorious show starts over again!